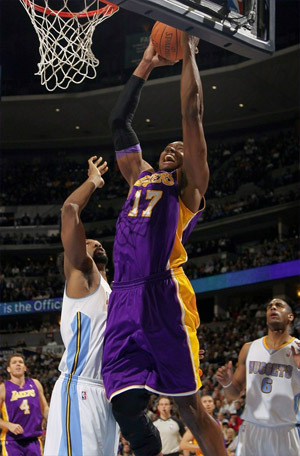 Andrew Bynum goes up for two against Nuggets. The Lakers have had their problems in Denver the last few seasons, but righted the ship on Friday with a solid 107-97 over the Nuggets at the Pepsi Center. The Lakers rebounded from their embarrassing second half performance in Dallas on Wednesday, with a much better all-around effort against the Nuggets, especially from their frontcourt, which dominated all game long. Pau Gasol scored 19 points and grabbed 13 rebounds, Ron Artest scored a season-high 19 points, Lamar Odom poured in 18 points and 10 rebounds, and Andrew Bynum chipped in with 17 points and seven rebounds, part of a very balanced attack for the world champs. The Lakers got 73 of their 107 points from those four players up front. Kobe Bryant scored 18 points on 8-15 from the floor, to go along with seven assists and six rebounds. He also made several critical baskets in the third quarter to help the Lakers pull away. The game was close throughout the first half, with both teams trading blows. The Lakers trailed early by seven, but fought back in the second quarter and forged a 41-36 lead. The Nuggets then went on a 16-8 run to end the half, to take a 52-49 lead to the break, the same three-point lead they held after the first quarter. 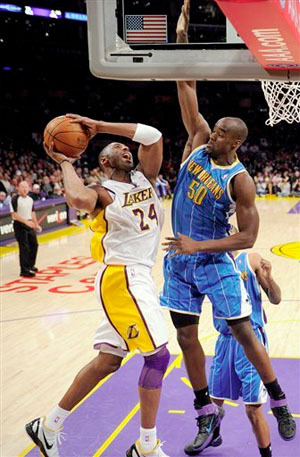 But Bryant led the charge in the third quarter, as the Lakers took control of the game, and led 82-72 after three. In the fourth quarter, the Lakers never let up. The Nuggets could get no closer, as Los Angeles led by as many as 14 points in the final period en route to the surprisingly easy victory. The Lakers absolutely destroyed the Nuggets on the glass, 47-27, including 15 offensive rebounds, which gave the Los Angeles 10 extra shots. The Lakers also shot 53.4% (47-88) from the floor and turned the ball over only nine times. The good shooting and protecting of the ball didn’t allow Denver to get up and down the court for easy baskets, which has been their trademark against the bigger Lakers. Denver didn’t shoot poorly at 47.4% (37-78), but hit only 7-21 (33.3%) from the three-point line, and managed to get to the free throw line only 20 times, converting 16. They lead the league in foul shot attempts, at over 31 per game. Carmelo Anthony, still in a Nugget uniform, scored 23 points, but shot just 10-24, as Artest made life difficult on the All-Star most of the night, forcing him into tough shots. Aaron Afflalo had a superb game with 22 points on 8-11 from the floor, including 5-7 from beyond the arc. Chauncey Billups added 16 points. The win snapped a two-game road losing streak for the Lakers, and may have been their best win away from Los Angeles this year. They’re now 15-8 on the road, and have won 11 of their last 14 games overall. The Lakers’ next game is Tuesday night against the struggling Utah Jazz at home. The Jazz beat the Lakers earlier this season 102-96 in Utah on November 26th, a game that saw Los Angeles blow a 19-point lead. Tuesday’s game against Utah will be the first of five straight at Staples Center for the Lakers, as they also face Boston and San Antonio on this homestand.